Not exactly a graphical masterpiece, even for the early days of Nintendo, the game was still fun. 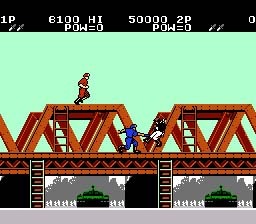 A thinly veiled fight against 8 bits of communism, I was never sure if I was playing Rush 'n Attack, Russian Attack, or Rushin' Attic. That’s not even a joke! I mean, it’s not a joke because it’s not funny. Anywho, the game play was rather difficult and nearly impossible to beat without a game genie. I think the best I did playing legit was around level 4. The whole key to the game was getting the glowing rocket launcher, which was actually just a "D" on it’s side. Above: Easy to swallow, it’s 1 byte of communism! The other highlight of the game was the fact when you killed someone (always with one hit) they gave a fruity jumping scissor kick, then fell through the bottom of the screen. Trust me, it makes sense. Fun Fact: In Megaman 3, the English translators were going to name his sidekick "Rushin' Attack" however they didn’t after they realized it infringed on the rights of this game. Instead, they just shortened his name to "Rush," but they still kept his color Moscow Red. Also, Megaman has sucked ever since. Horrible pun: If someone takes too long to finish college majoring in Russian, shouldn’t they be called a Stalingrad? Too Soon? I gotta be honest, this game only made the list for pure reputation. It was a great game and all, but I just never got that into it. Maybe I was still waiting for a game that kept season stats and allowed multi-seasons and that sort of jive. The game play itself was great, but in fairness, I just didn’t care. However, leaving it off the list would have been a total travesty, I’m aware. Above: Allan Trammel vs. Frank Viola. Much like the game, I say, "Meh". It is one of the few games to fully explore the studio space of the gamecube. A great 'cube only title that had superb action and a solid story line. But, you did fight a lot of bugs. Above: Yes, Samus is a girl, we get it. Fun Fact: Metroid Prime is the only gamecube title to make the list. A game about the civil war. A game with several different action screens, including the bizarre battles where cavalry would charge, and one side seemingly arbitrarily won. A game where a tomahawk could randomly appear on the overmap and kill a battalion. Why not. However, the game was someone ground-breaking as a pre-cursor to console RTS games. It featured the ability to start at any point during the war and it had trains! The key was to always blow up the bridge, b\c once the horses started, you had no way to stop them, and they would be lost in the ravine. There can be only one!! Fun Fact: There is a cheat code to enter "Assassinate Lincoln" mode. You could say that to almost anyone and they’d know what you were talking about. Above: Check out my 73 foot vertical leap! Fun Fact: While everyone had a favorite team, the Warriors were easily the best. There, deal with it! A fantastic game. Played well, the graphics were acceptable, and provided a solid challenge. The whole, "I’m gonna swing around with this hook" was awesome. However, the game lacked a little fun factor for me. Jumping ... Hello? Above: Why is that guy entirely pink? Plus, I always enjoyed the “neutral areas”. It seemed so ridiculous, but hey, whatever. Fun Fact: In the Japanese version, one would fight Nazi and then kill a revived Hitler at the end of the game. Americans, however, have to kill "Master-D." Apparently, Japan decided to change sides about WWII. The greatest, "we’re at a bar, let’s play video games!!" game of all-time. The controls are simpler than usual golf games, but require dexterity that slowly leaves you as you drink. Trimming it down is what makes it great. Above: Putting from the rough ... Eh!!! Fun Fact: While making a new arcade version every year, the game is rarely any different. However, it is still uber-popular after more than a decade. Look, shut your face, all right. Bouncing on enemies with a spring loaded cane operated like a plunger by an elderly duck is fantastic any way you look at it! Above: Well, I just Scrooged the pooch. Fun Fact: Probably the shortest game to defeat on the list, a skilled player could probably beat it in 20 minutes. Let’s cut to the chase here, I love watching the fat River City Ransom kids get hit by things. When they get tired, they breath heavy, and when they get eliminated, they turn into angels! **Cute Alert! ** Learning how to do the super throws was easily the most important and most fun part of the game. Fun Fact: If you hit a player hard enough, his body could get stuck in the edge of the screen, have a 3 second spasm, then be thrown back into play. "A winner is you!" I’d tell you about each wrestler, but wikipedia does it for you. I’ll just say, if you were star man, you were a tough out. But the "brain buster" has always had a special place in my heart. 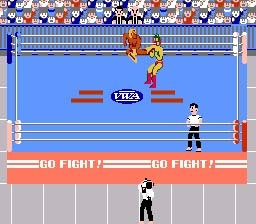 Fun Fact: Pro Wrestling is the only video game Scooter has ever defeated. So. DUCK TALES? Seriously. I think TJ (Diddy) was on acid while compiling this list. Okay, the first installment I didn't really like that much. This one was much funnier. As expected, I've only heard of a few of these games, but bravo so far. Keep 'em coming. I really liked both posts. What's not to like about the Paperboy fun fact? Excellent work, good man.